Everyone always asks about my diet. Actually, I’m assumed to be vegan most of the time. I’m not vegan and I don’t necessarily support veganism, although I do think it’s an amazing lifestyle and diet choice for the right people. I also try really hard to stay away from non-organic food and genetically modified organisms (GMOs). This is really important to me. Here’s just an overview of my diet. Look for the “Non-GMO” label on foods before you buy or choose organic, as current regulations prevent the use of genetically modified crops in organic food. The reason it’s called “Non-GMO” rather than “GMO-Free” is because it’s apparently really easy for cross-contamination between fields to occur between GMO crop and non-GMO crop. They cause tumors in rats (although that study has since been retracted… suspicious). GMO crops are fed to most of the livestock you eat, so it’s in animals products such as meat, milk, cheese, and eggs. It’s not natural for most of these animals to be eating grains, let alone genetically modified ones. Oh, and also, they are completely screwing with our ecosystem, making bugs resistant to pesticides and plants resistant to herbicides. We now have trouble controlling unwanted plants and bugs due to the fact that they adapt so fast to whatever mankind can throw at them. So, done with the GMO lesson. If you want to find out more information, please educate yourself and do some research. Currently, anything organic cannot be genetically modified. This is another great reason to buy organic! I eat a lot of organic fruits and vegetables. I eat organic brown rice, quinoa, and local eggs, among many other things. I know organic isn’t perfect: they still use pesticides, just ones that are “organically derived”. I feel organic is the better choice. Plus, when a conventional strawberry contains the residue of 17 different pesticides after washing, I’m inclined to think the organic option is better. Almost everything I buy is organic. If you’re interested in seeing the list of foods you absolutely should buy organic, check out this list. I only eat meat if I know who specifically killed the animal. My brother hunts deer, so I get deer meat from him. I like to know that the animal had a natural life and ate what it would normally eat in the wild (unfortunately deer do like to eat GMO crops, however). I also got a turkey from people I used to nanny for. I saw the turkey every day I worked there and know it had a happy and natural life. So yeah. I never buy meat at the store or order meat at restaurants. I really prefer local meat. We also get beef from a local cattle ranch where the cows are allowed to graze and their pasture is organic. We eat meat once or twice a week at the most. I definitely don’t miss eating meat with every single meal. 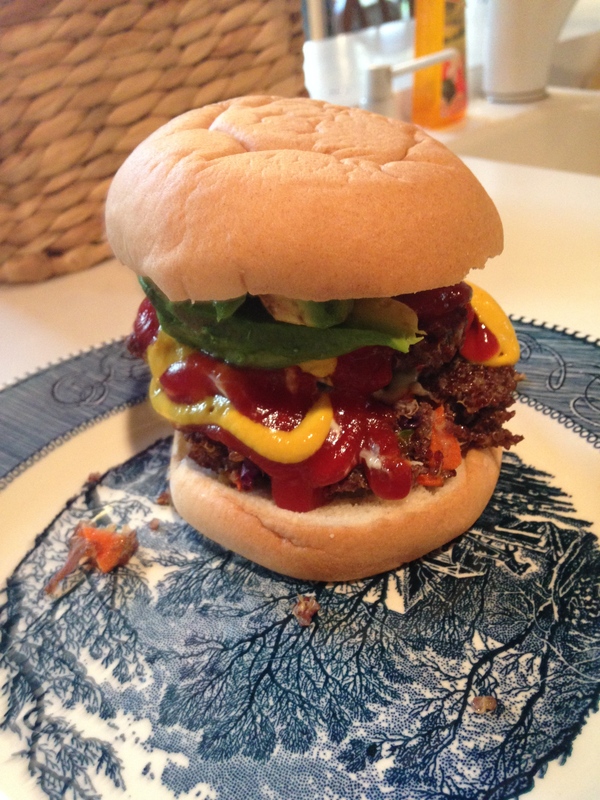 My boyfriend Ian made these delicious creations called quinoa burgers. Delightfully simple to make and so delicious you won’t even miss the meat! Don’t judge, I love my organic mustard and ketchup. We also love this burger on a gluten-free bun with avocado. I only eat wild-caught fish, never farmed fish, and wild and pole-caught tuna. I’m not a big fish eater and so don’t eat fish that often (I know it’s really good for you I just don’t like the taste that much). My neighbor fishes and I occasionally get fish from him as well. Local! I definitely don’t eat sugar every day, but I do still eat chocolate, cupcakes, and marshmallows on occasion. The sugar I eat just needs to be free of gluten and dairy, thank you very much. In addition to being intolerant to gluten, I’m also intolerant to dairy, meaning my body reacts to it and I can’t eat. I don’t really miss dairy as the dairy industry is horrible and inhumane. Plus there are so many great alternatives these days. So yeah I do still enjoy some vegan cheese. 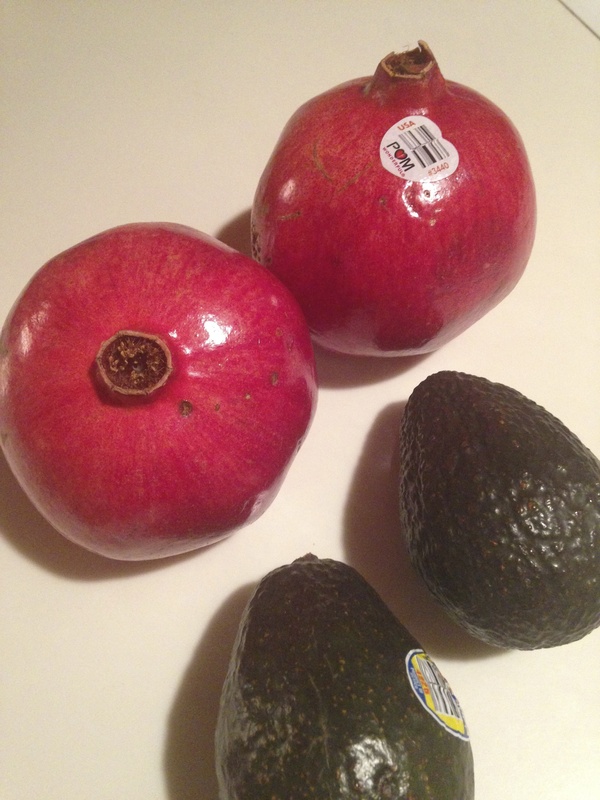 I love pomegranates (in season now!) and avocados. I also love veggie, gluten-free, dairy-free pizza. And gluten-free, dairy-free, non-GMO nachos (another Ian creation). 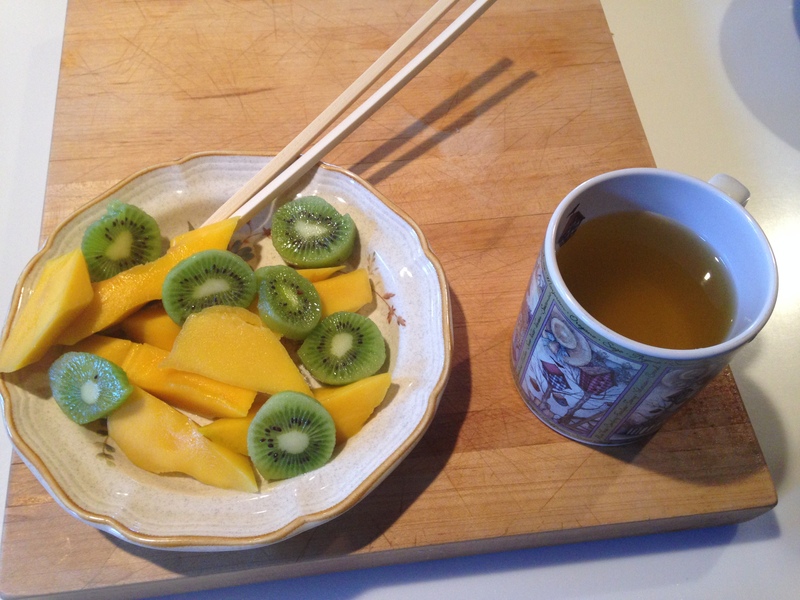 Organic green tea, mango, and kiwi. 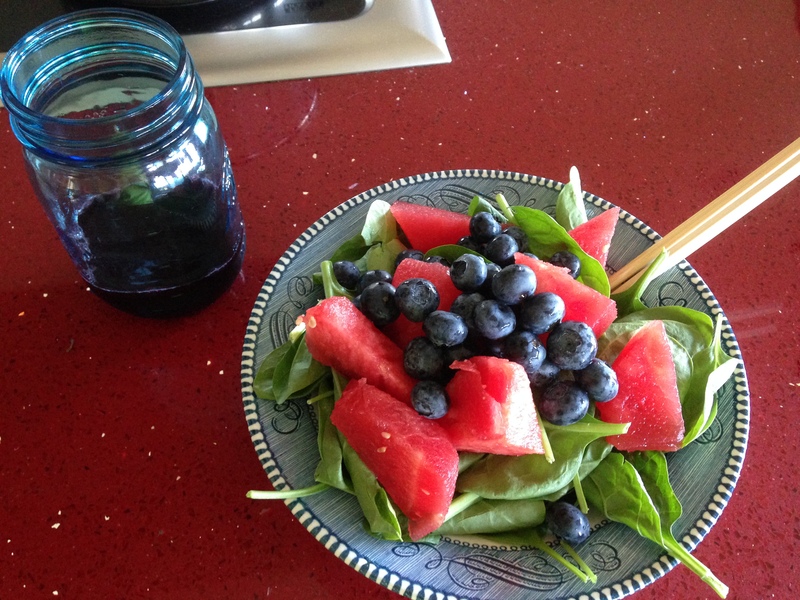 Or, organic spinach, blueberries, and watermelon with pom juice. I love to get creative with food. 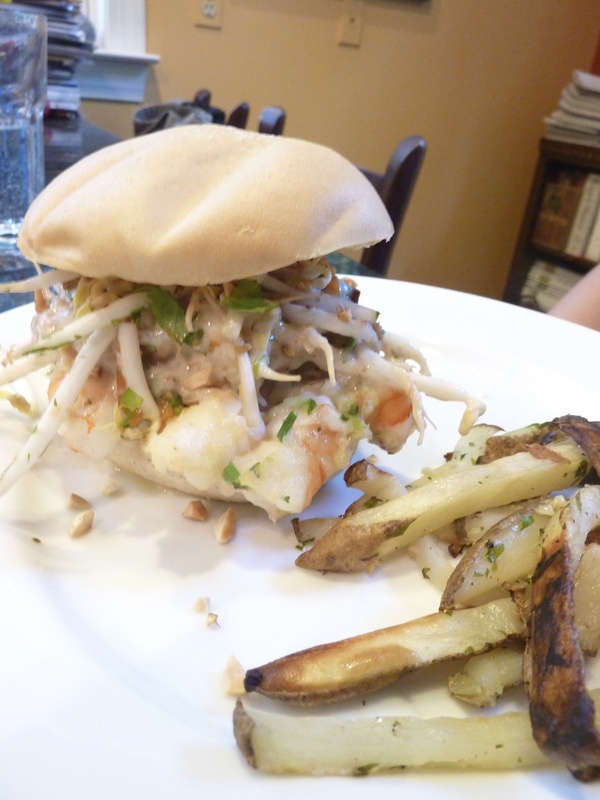 So a couple years ago for Ian’s birthday, I made us shrimp pad thai burgers (Ian and I adore Thai food). Jealous much? No? Well, you should be, because they were delicious! And this past Valentine’s Day I made us homemade sushi, with vegetables, of course. So you see I eat much like any normal person would (except normal people don’t have awesome food as often as I do, whaaatt). I just don’t eat bread that often (gluten-free bread is expensive!) and I pack on the veggies and fruits. I also make a wicked soup for when I get sick, which isn’t often at all nowadays. So, I’ll admit that I do splurge. You have to when your diet is a little limited, right? When I do splurge I go to my favorite organic market and buy myself a kombucha and a package of these amazing cookies. So, the ingredients aren’t totally awesome but they are gluten-free and non-GMO. I love you, Liz Lovely! And for the record, I’ve made a lot of gluten-free cookies and bought a lot of them too, but these take the cake hands down in any situation. Take care of your body: eat great food! 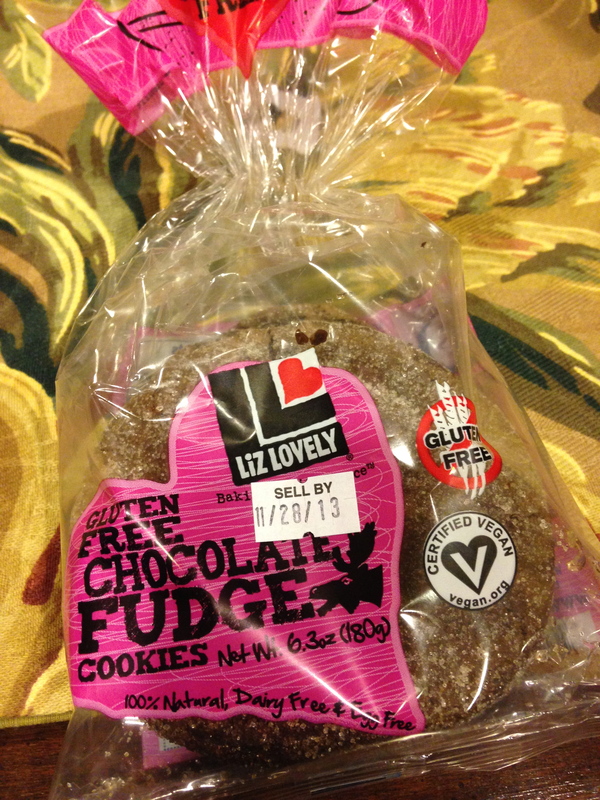 Do you share your recipes for gluten free cookies? Hi there! Most of the recipes I use are taken from other sites, so no. When I feel like being bad I’ll use a pre-made mix, but this rare! I try to avoid eating refined sugar like this as much as possible 🙂 Thanks for your comment!